Once packaging just had to protect goods as they made their way along the supply chain. But today’s successful wrapping materials have to be cost-effective, look good and have a minimal impact on the environment. In addition, the rise of ecommerce and online retail is presenting new challenges for materials that safeguard goods in transit, as they need to accommodate all shapes and sizes of packages, be fast, durable, versatile, easy to use, green and attractive. As other more complex issues are included in the mix, such as branding and return of items, the demands on packaging become even higher. In the old days, effective solutions were a fairly simple equation of cost versus waste. Now it is more complex, as the materials which assist with the goods’ safe journey may be needed to perform as a point-of-display unit. This has advantages in making the materials deliver more value, retaining control of the presentation of the goods in the sale setting, and ensuring the display unit supports the branding and marketing strategy for the goods. Obviously, the materials must perform their branding duties in conjunction with providing physical protection during transit and look good during the entire sequence of events. This does place extra demands when producing materials that can carry out all these functions and remain cost-efficient, easy to use and environmentally neutral. Too much packaging must be avoided, as it annoys customers who expect brands to be aware of corporate responsibility, and it will reflect negatively on a brand. There is a growing realisation that customers want the environment to be a consideration in producing wrapping materials, and that a holistic approach that incorporates sustainability could find favour with consumers. The wrong approach could lead to damaging posts on social media, along with destruction of brand loyalty and reputation. 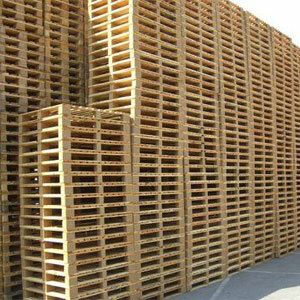 Wooden pallets are often seen as more environmentally friendly than the plastic variety, but plastic can be recycled and upcycled too. According to IMRG (Interactive Media in Retail Group) figures, in 2015 the volume of online retail items increased by a significant 15.7 per cent. This rise in e-commerce means many customers are receiving goods in a state that must fulfil a range of tasks and be memorable for good reasons. There are two main trends in e-commerce: one is the purchase of relatively low-value items such as groceries, and the other is luxury shopping. With low-value items the cost and the speed are critical, along with adaptability in the areas of packing and filling by automated processes. One solution found is known as “bag in box”, where the groceries are placed in a bag which can then be delivered in a container which can be designed to express the brand and re-used on many occasions. For luxury goods, presentation and expressing the brand are extremely important. Personalising the package might even involve adding a scent, but not at the expense of alienating the customer with too much wrapping. Many online retailers have become aware that the way items are presented must substitute for the experience of the brand that would be received in-store while also communicating values such as quality craftsmanship and innovative design.